Email marketing campaigns are still around and being used with a high success rate. When email first came about, seeing the "You're got mail!" flashing on your screen was something of a delight, it was a new novelty for many and a great marketing tool for business. As the years have rolled on, and email accounts are being filled with more spam and junk mail than genuine emails, it's not regarded as being on the top of everyone's lists when it comes to marketing their business... however, it is still a very powerful tool that shouldn't be cast aside just yet. Firstly, the best thing about emails is that people are checking them on the go. What does that mean? It means you could send an email straight to their pocket, and they can pick it up on the fly. They could be on tube, they could be walking to the shops, they could be sat at home browsing online. They could be just about anywhere and you can reach them with your message. Secondly, it's not only inexpensive for your target audience (receiving an email is free!) but it's inexpensive to you too. You can reach a large number of consumers for a low and fixed amount. For small business owners on a budget, this is a much better strategy than looking at traditional marketing channels such as TV, radio or direct mail. Thirdly, if you're offering an incentive in your email marketing campaign... whether it's a coupon, or a percentage off of their next purchase... statistics show that it's a sure fire way of growing your business interest and to reach your target audience. E-coupons (such as the ones you see on Groupon or Wowcher) are big business, and email marketing is right at the centre of it all. Finally, your email campaign can be personalised to your customer and make them feel like you're really making the effort to keep them in the loop. If they feel like they're getting an amazing deal, they will more than likely take advantage of it. If you have a brilliantly designed, and well thought out email campaign, you could see your business grow considerably. It's all about getting it right. You'll need to do your research. Companies such as MailChimp and iContact are popular third party companies that many people shout from the roof tops about. 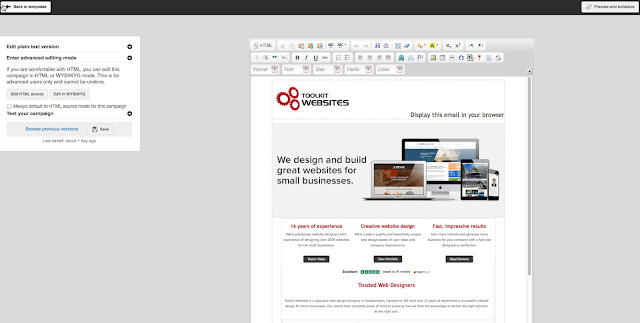 It might be worth seeing if your web designer has an email marketing service available to you. After all, if they are looking after your website it might be worth investing in email marketing campaign services with them as well. At Toolkit Websites for instance, we have our very own Toolkit Broadcast Service. You can stay in touch with your customers, employees and/or prospects using our very own system. There are no add-ons, and no hidden fees. When you sign up for our email marketing service, you receive our full suite of features - it's everything you need for marketing your business via email. Whether you are switching from another email system or starting from the ground up, Toolkit Broadcast provides a complete business-class email marketing service for as little as 0.8p per email. One of our happy clients said: "After sending out my first newsletter I had over 20 reservations in the restaurant in just the first weekend. Great open rates and great response from my designed newsletter compared to my own personal attempt!" Feel free to get in touch with any questions you have about Toolkit Broadcast or any general questions you may have about your email marketing campaign.